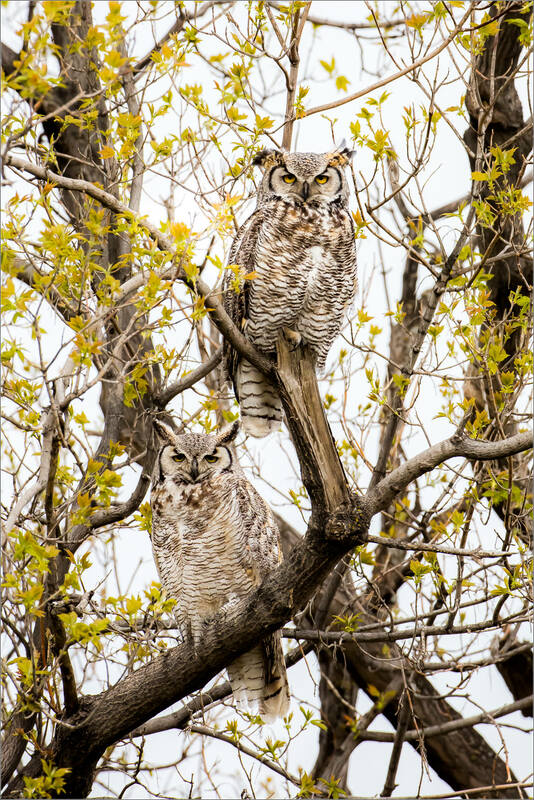 These two Great horned owls flew between various perches among the strip of trees I found them in east of High River. 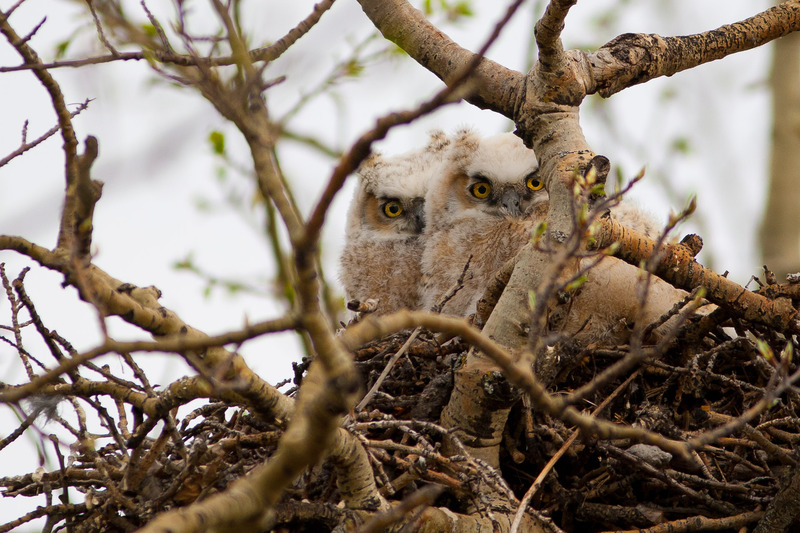 I watched them for two hours as the morning’s overcast sky brightened. 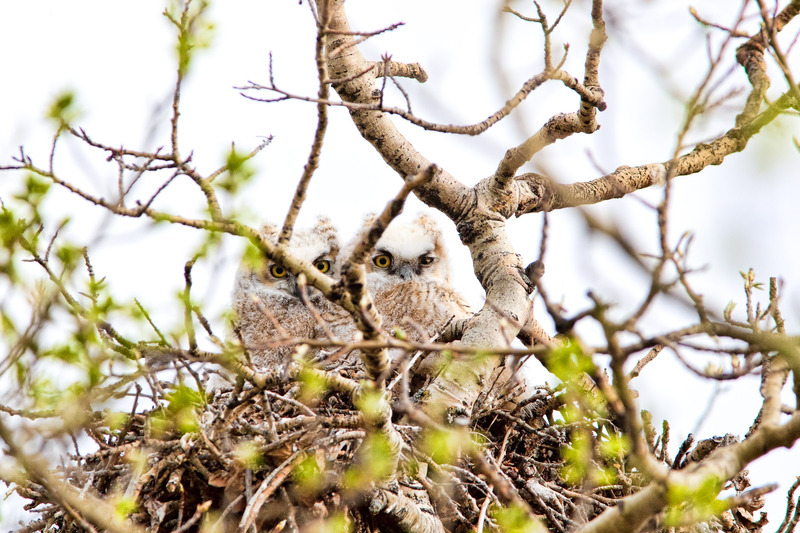 They were unsettled by ravens a couple of times but mostly seemed to be resting while keeping eyes on the fields they looked over. When they did fly it was worth the wait. 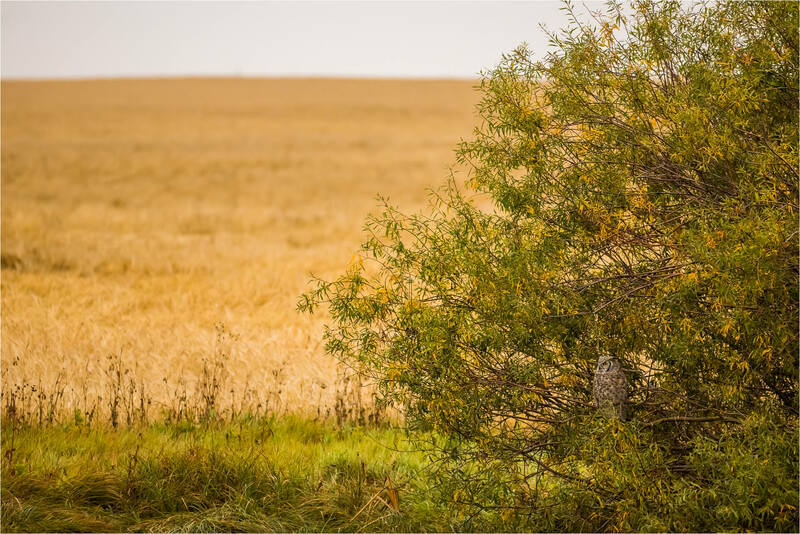 I found this Great horned owl and her mate flying around a long line of trees on the edge of a farm field east of High River. 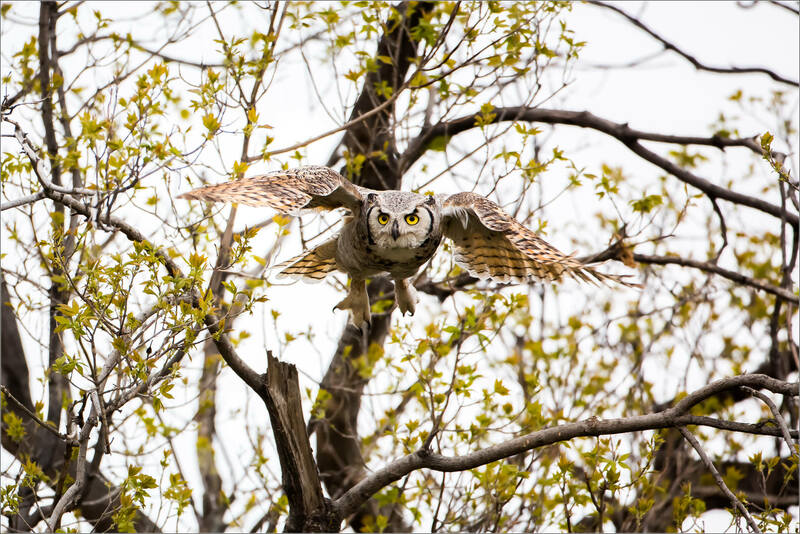 On this flight she flew at eye level, very close to where I had my camera and lens setup on a tripod. Too close to fit the whole bird in the frame but I was happy to get a sharp image. I hope that everyone is enjoying a Merry Christmas with those they love. We had an early start with Santa’s stockings for the kids starting the morning off right. Coffee helped the adults wake up, and then catch up, with Kezia’s and Kian’s enthusiasm. A lot of laughs, smiles and hugs – just what this daddy was looking for! 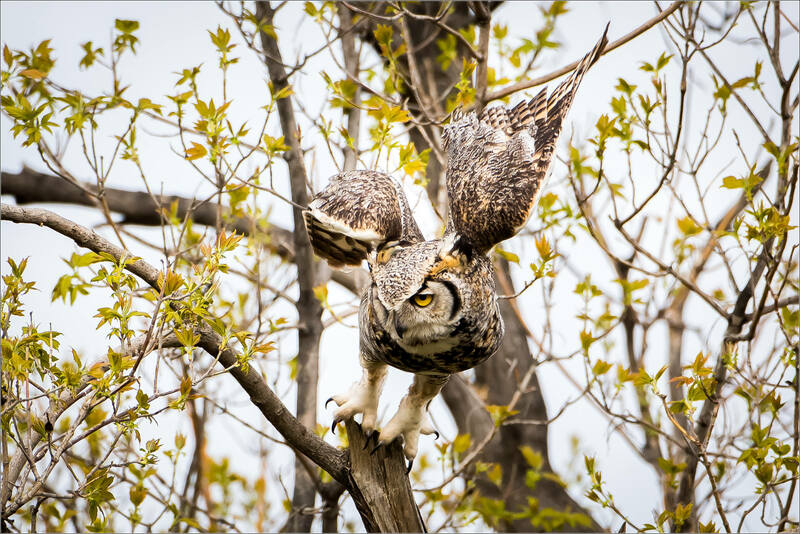 This Great horned owl was a patient subject when I was guiding a new friend and fellow photographer from Colorado around the prairies. 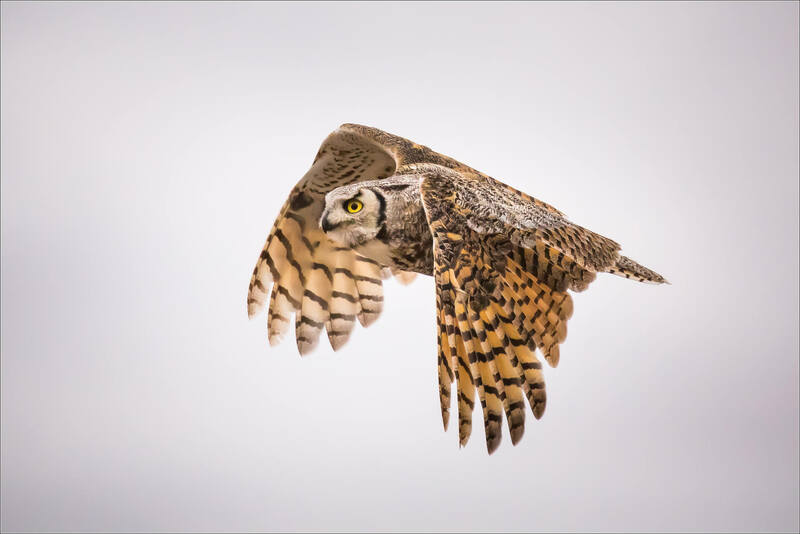 We toured the gravel backroads east of High River and this was the first of three owls (two Great horned and one Snowy) we spent some time with. 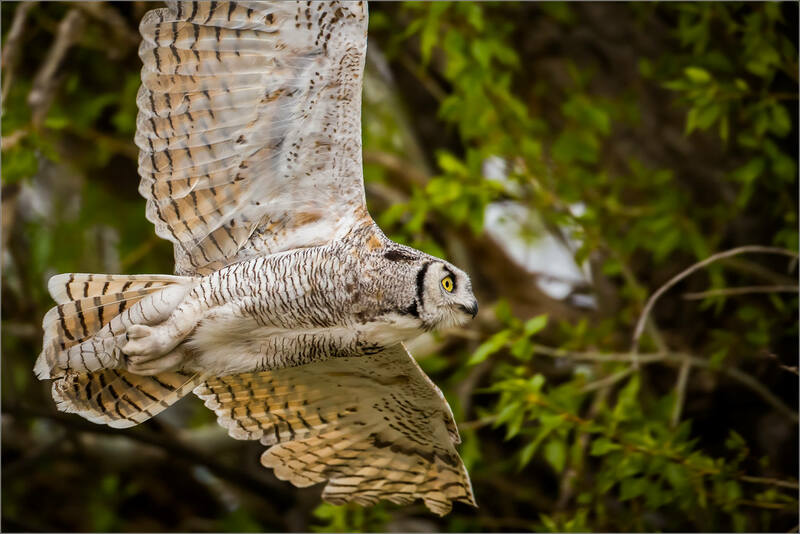 With the very light plumage, I think of it as a Christmas owl. It must be the season! 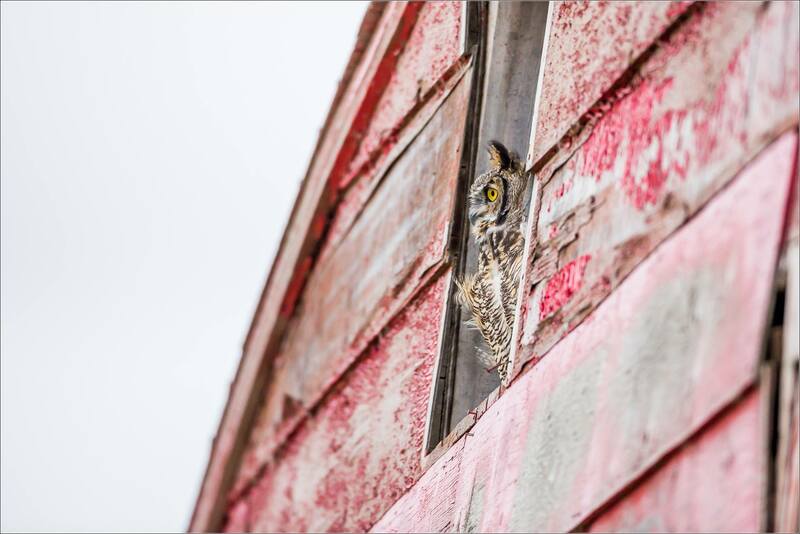 I found this Great horned owl (Bubo virginianus) perched on a long abandoned barn’s window sill. It was a cold day and this spot was out of the wind and facing the sun, which did come out a little later. Pretty smart place to doze the daylight hours away. 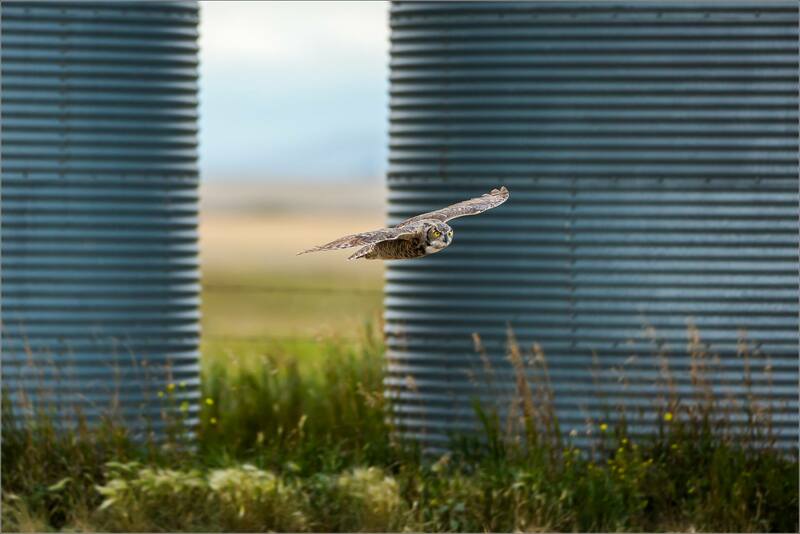 I had the great pleasure of seeing a Great horned owl at an old barn east of High River. It is one that I have visited a couple of times over the past couple of years. This window, which faces north, is a favourite daytime perch. 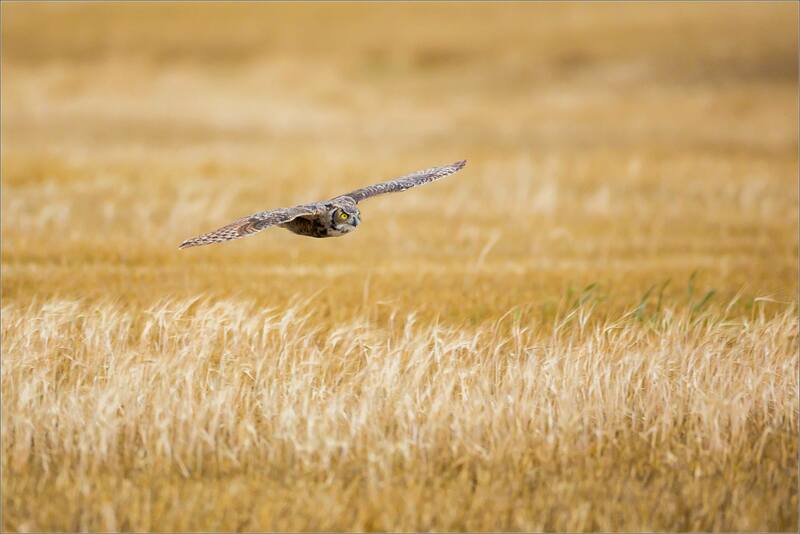 The heavy clouds only threatened rain and their midday dimming effect seemed to encourage the owl to make a couple of sorties over the surrounding fields during the time I spent there. 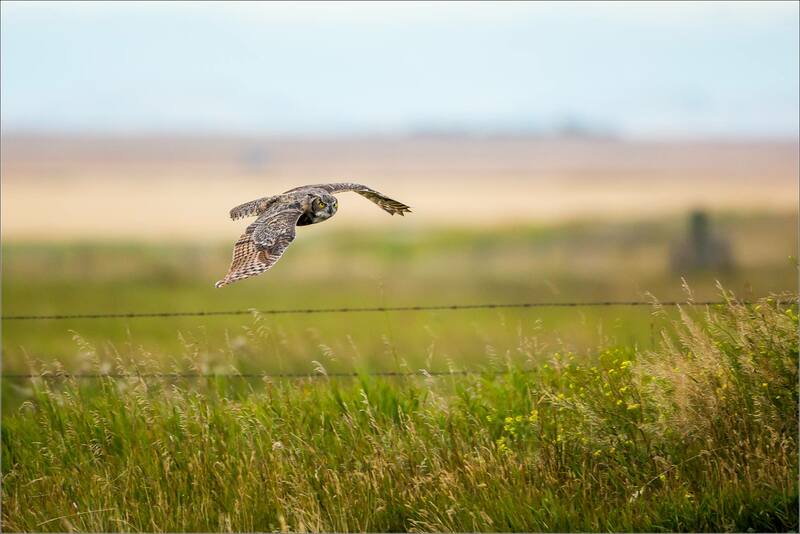 The owl flew along the fence line twice which afforded me a few great in-flight shooting opportunities. 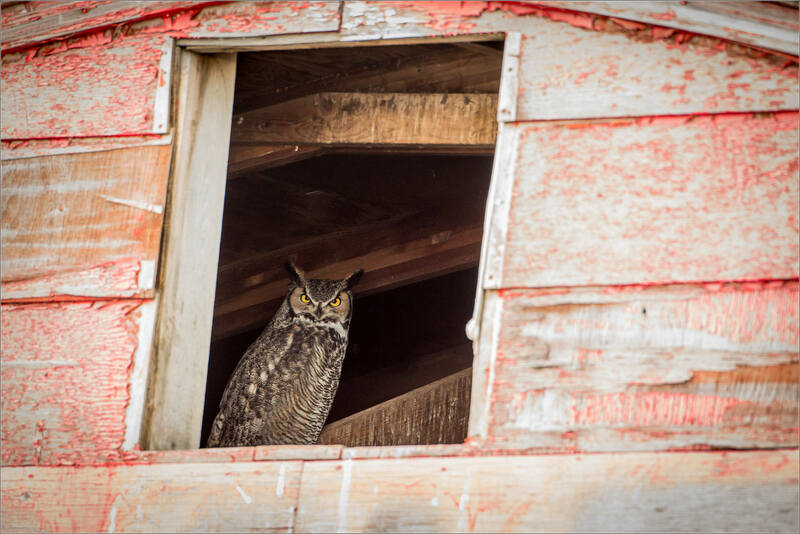 I left the barn with my friend perched in the deep shadow of the barn’s interior. 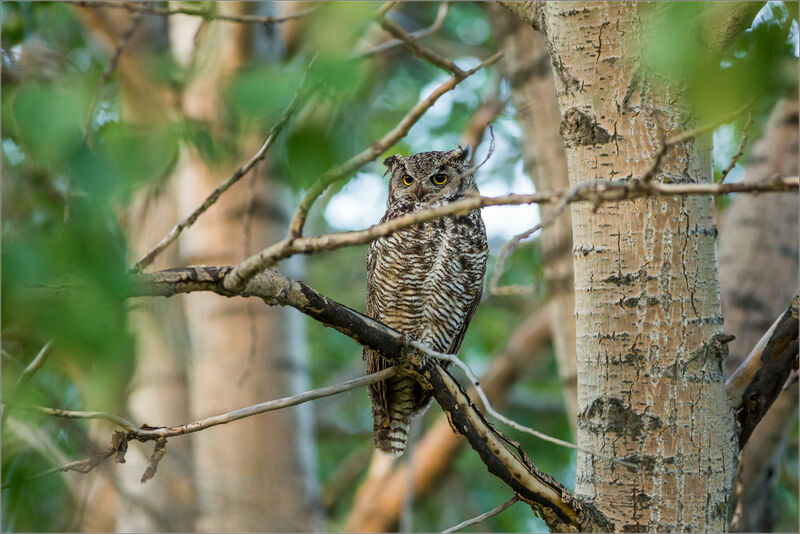 I drove to the High River area on the weekend to look for owls. 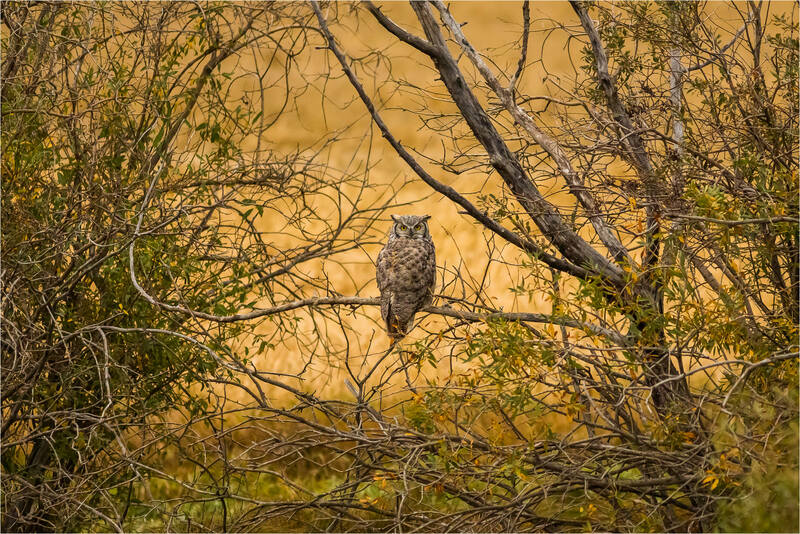 It was still dark when I found a Great Horned Owl (Bubo virginianus) perched to the side of a small pond east of Frank Lake. 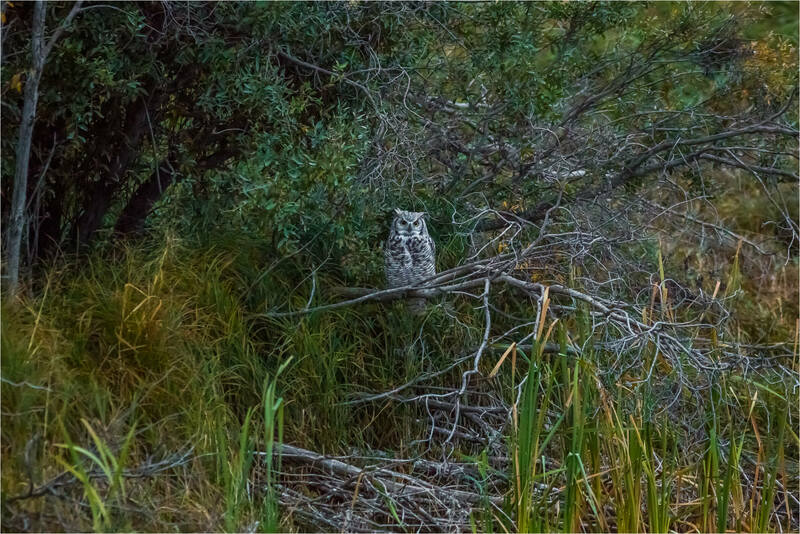 I set up on the side of the road and spent almost two hours watching him from across the water. The morning slowly got brighter but with heavy gray clouds diffusing the sunlight, it stayed dark for most of the first hour. 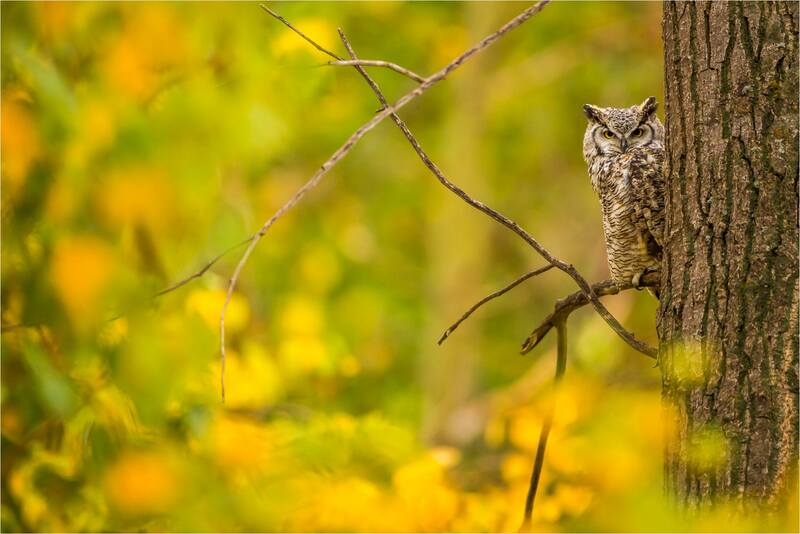 The owl alternated between short naps and moments of intent staring at any stray sound or motion. 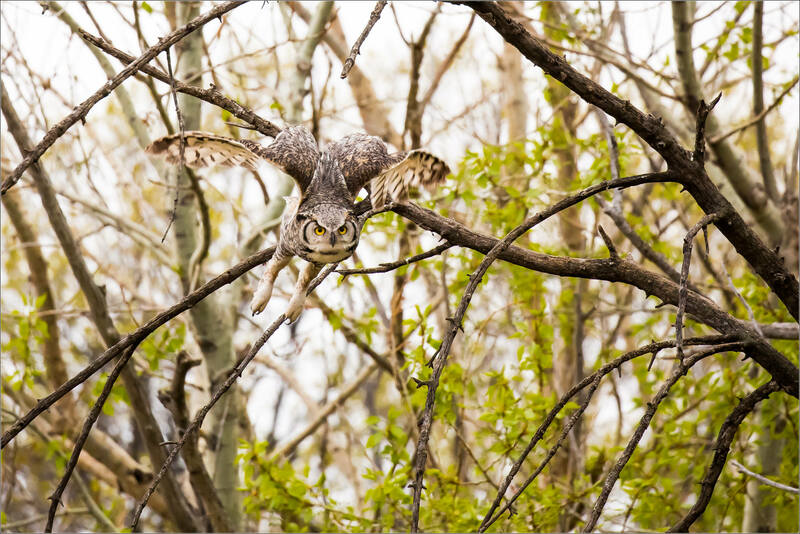 These last were both mostly imperceptible to me but kept my attention, and the long lens, focused on him. 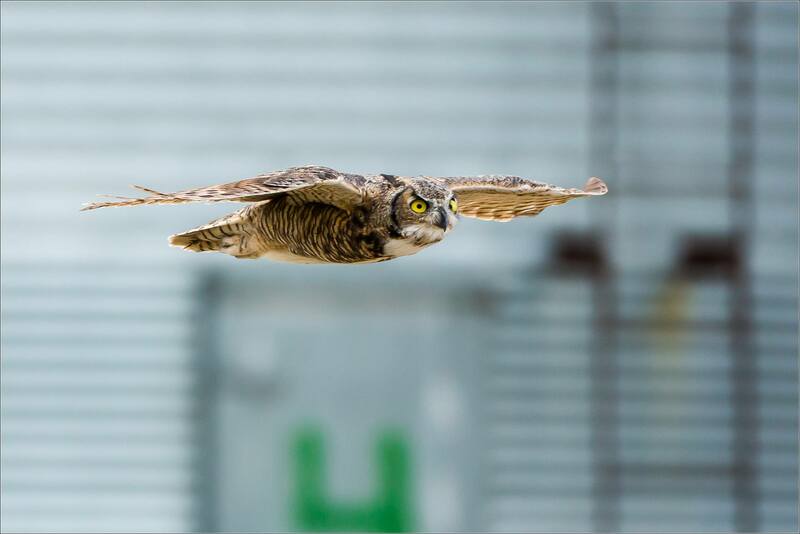 Just before 9 am, he stretched wings vertically and launched into the air. 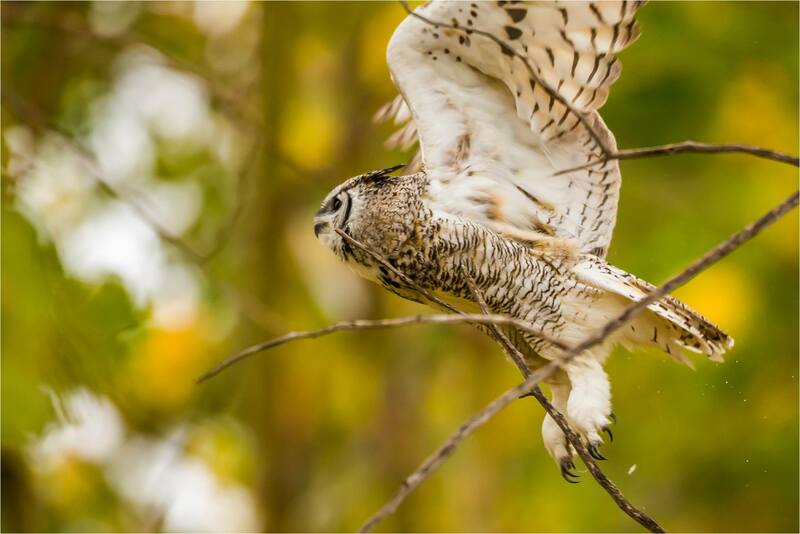 After a couple of quick strokes, he glided over the pond and landed in a bare limbed tree. 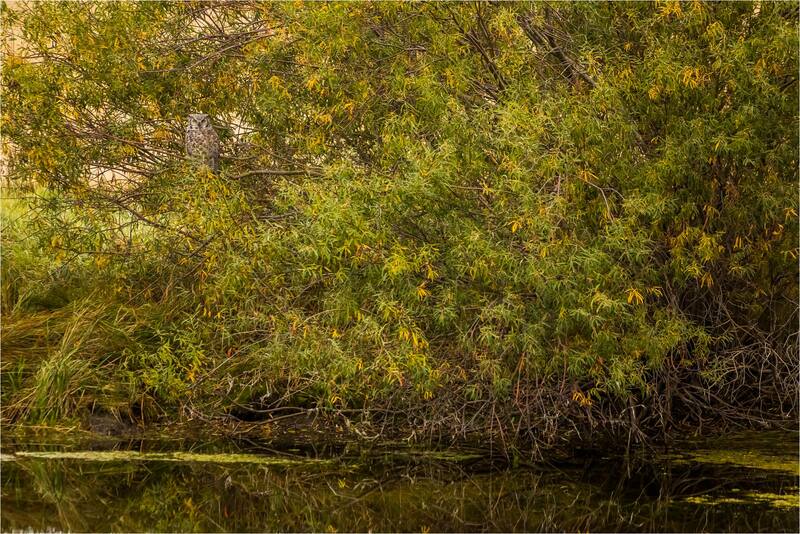 The skeletal branches did not suit for long and he crossed to another tree edging the pond. 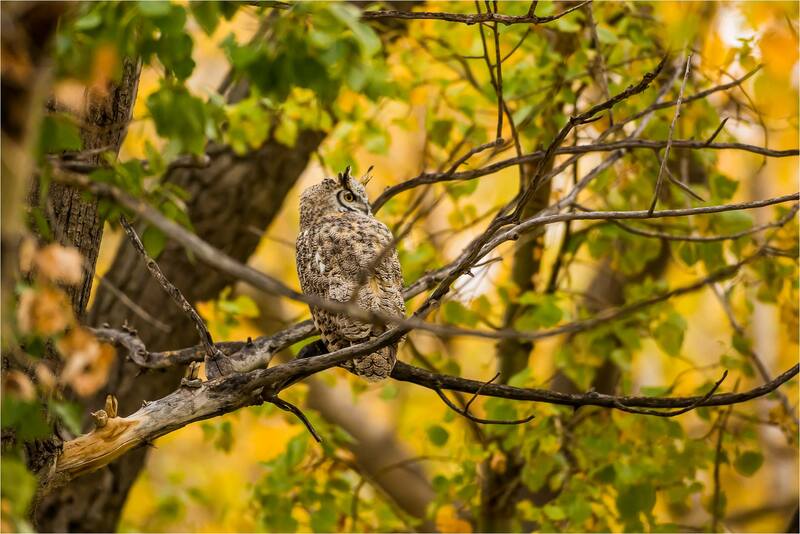 This tree was heavy with autumn tinged leaves and provided a third distinct setting for me to photograph this beautiful tiger owl in. 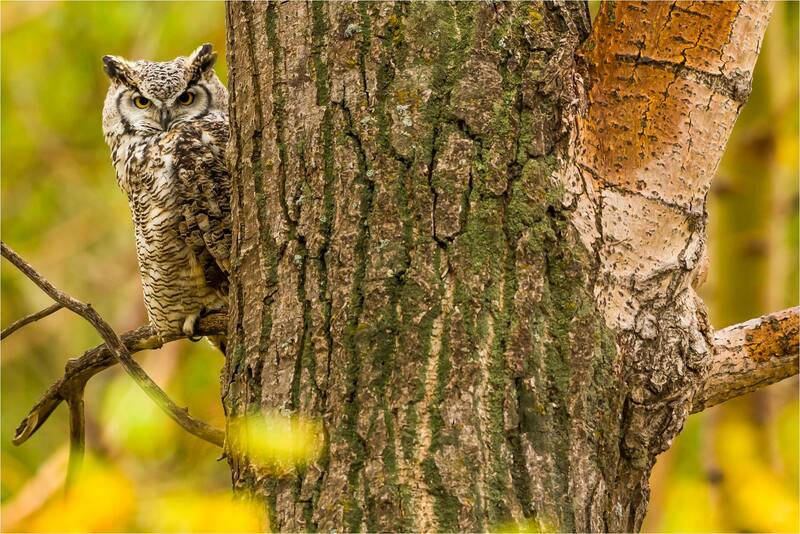 After a few more minutes, he walked down the branch and settled closer to the trunk and more out of sight. 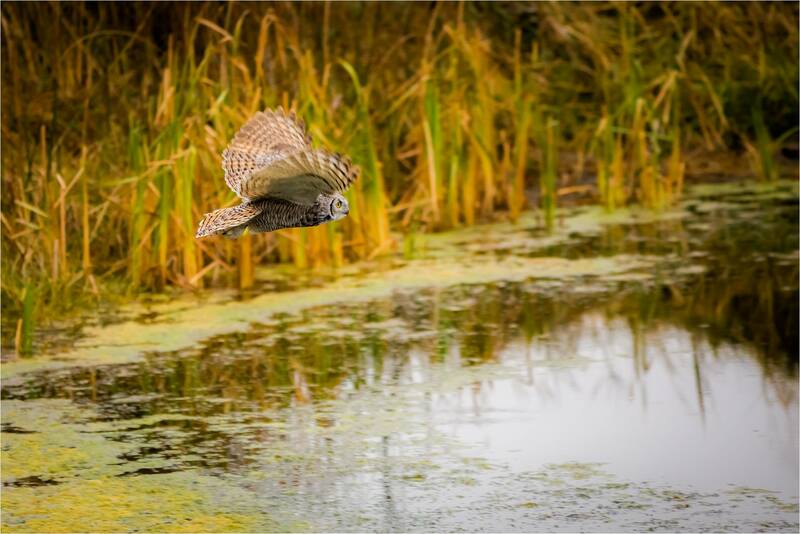 I packed up and while I was putting my tripod away, I watched him fly out and glide over the field behind the pond. 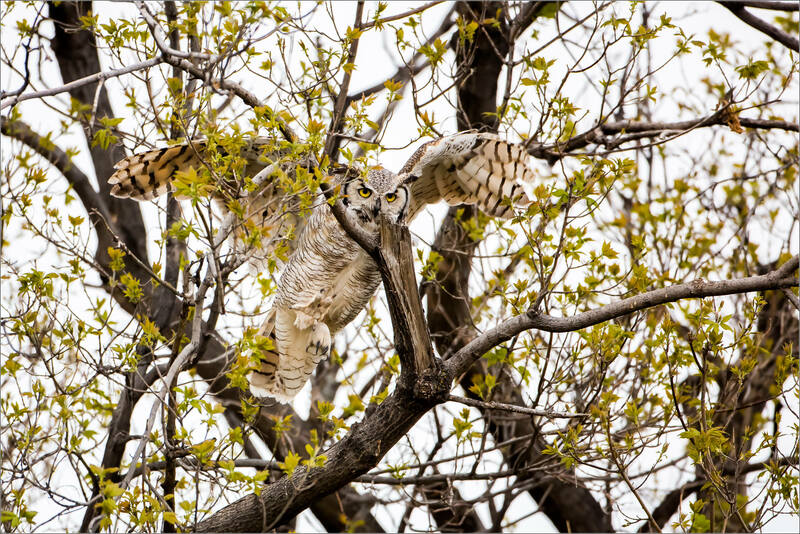 I found this Great Horned Owl near a nest that I watched earlier this year. 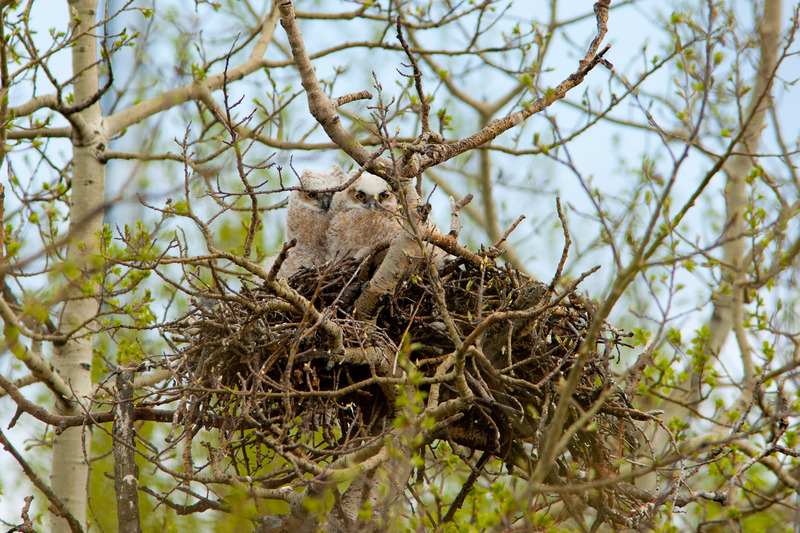 The adult pair successfully fledged two owlets by early June and haven’t seen any of the owls in the area over the past few visits. 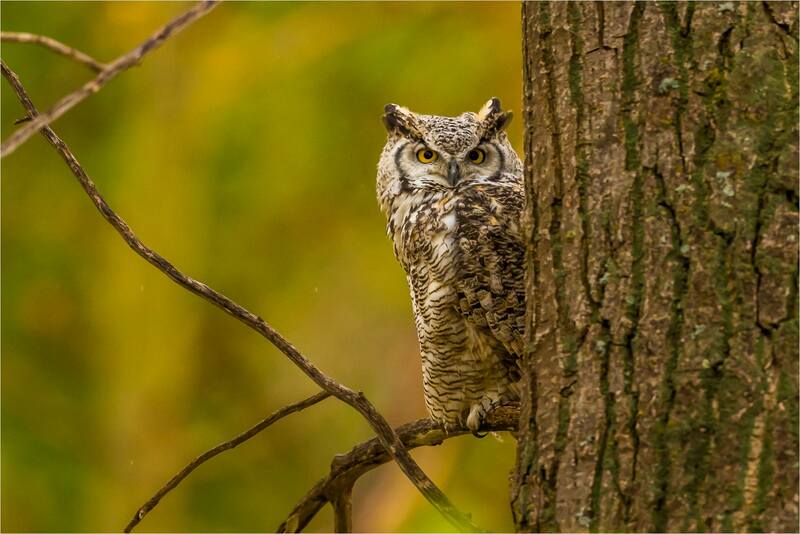 On the weekend, I spied this beautiful bird deep in a stand of trees. 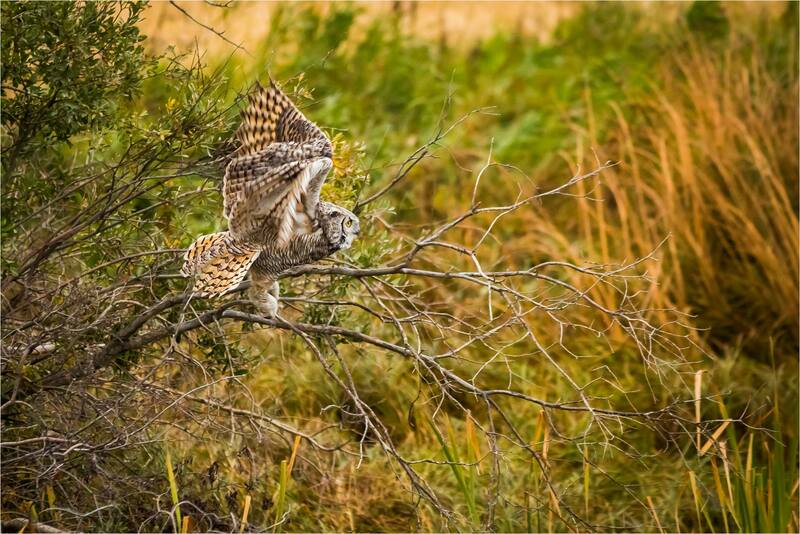 It seemed to be relaxing on this branch – probably just winding down from a busy night and early morning hunting before going for a sleep. It was great to see one member of this family again. I went out on the prairie a couple of times on the weekend. 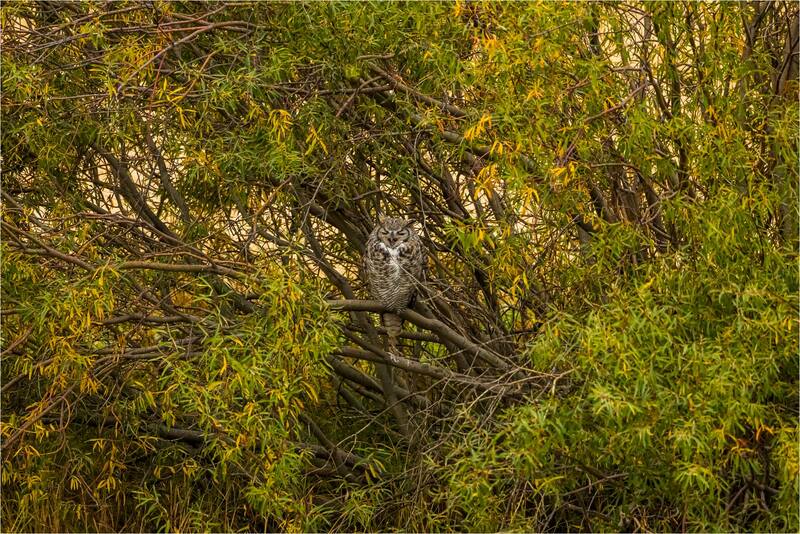 I was looking for owls. 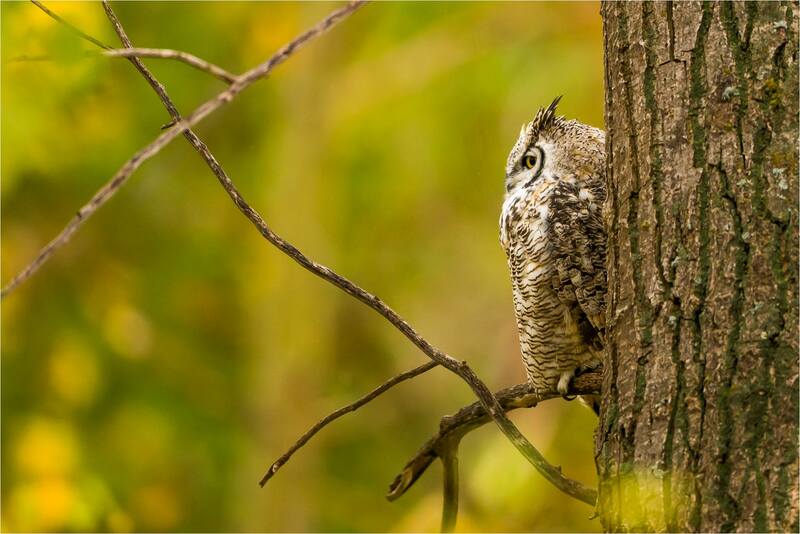 On the “hope to see” list were Great Horned, Snowy and Short-eared. I went to the back roads around Frank Lake. I encountered a couple of Snowies but it was too dark to photograph them. 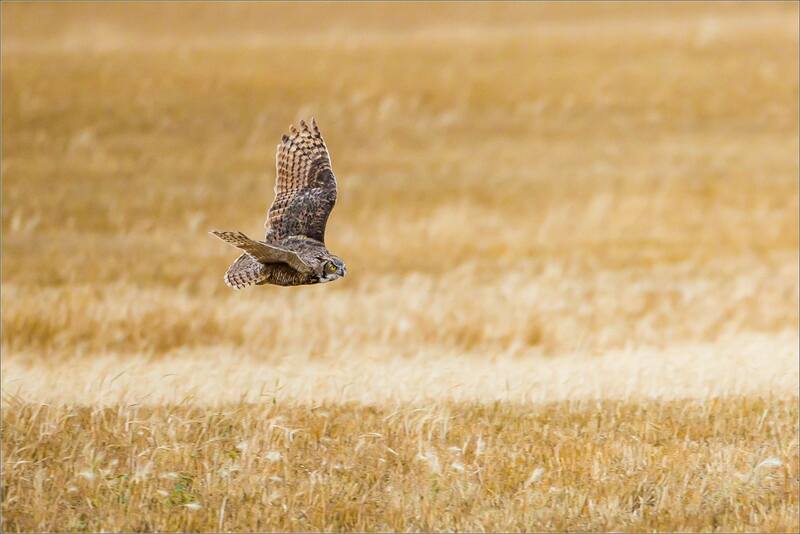 I returned to both locations in better light a couple of times but unsurprisingly they had both moved on. Nice to know they were around though. Short-eared proved elusive and I did not see any ears, short or otherwise. I did find a great old barn set off in a remote spot with a couple of grain silos on the first evening. 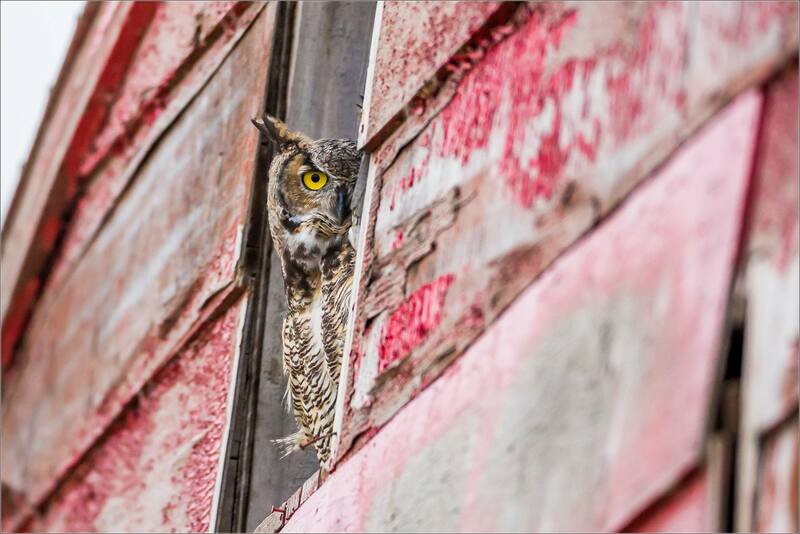 That scene was great on its own but the Great Horned Owl I saw perched in a window. The window frame was weathered with peeling red paint so character was not in short supply. 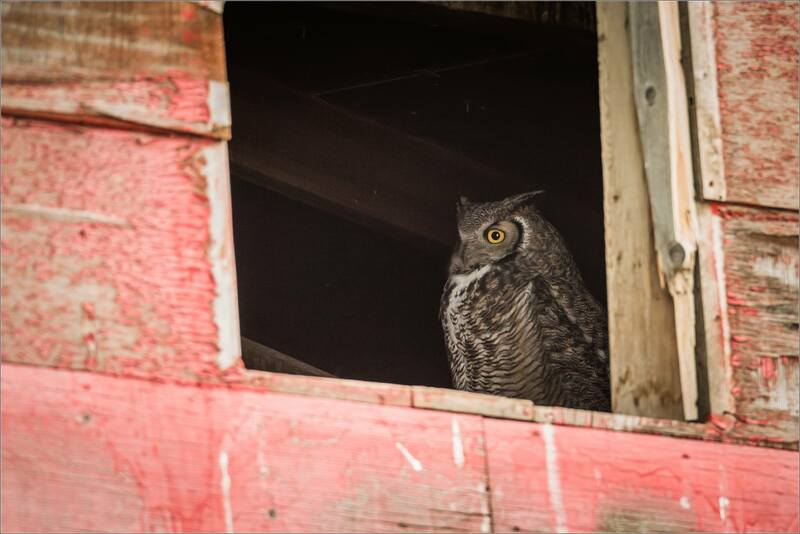 The owl was shy once I stopped my car and it hopped inside the barn to perch on a beam. 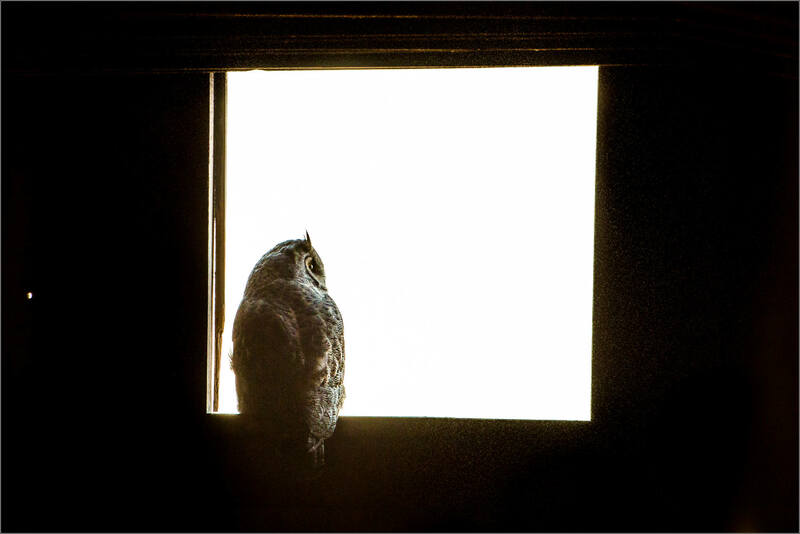 I set up a ways back from a west-facing window at the other end of the barn in the hopes that the owl might fly through it as dusk approached and it went out to start hunting. 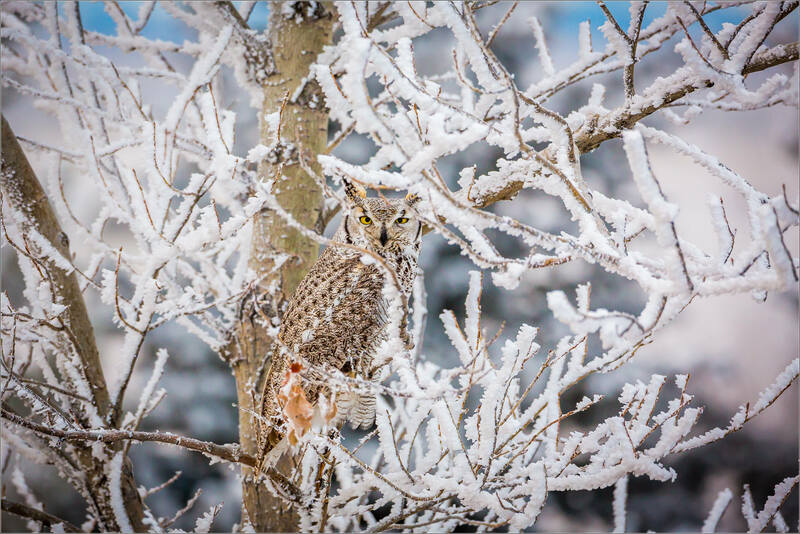 A chilly wait through the golden light had no results and when the owl did head out, it flew through the eastern window. While I waited, a long lens and high ISO allowed for a couple of nice shadow dominated images. 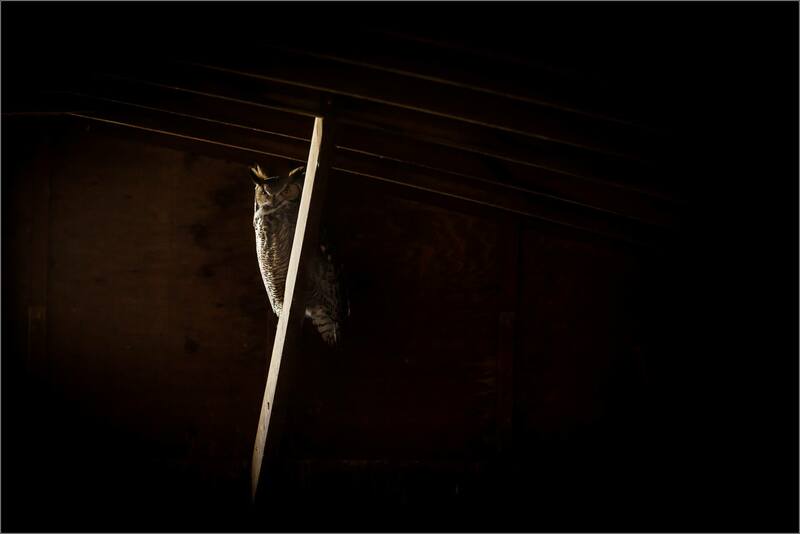 I left the owl the first night with it perched on a fencepost near the barn. 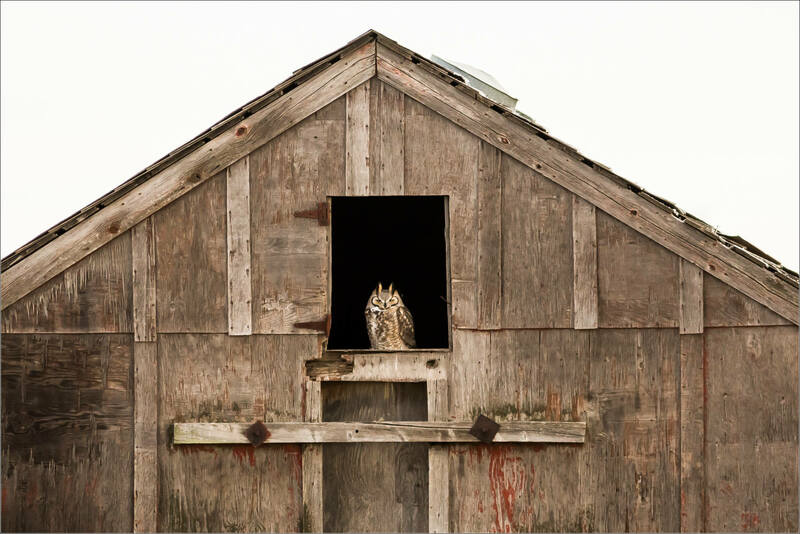 When I returned home and looked at the images, I was surprised to see a second owl buried in the shadows inside the barn. It had been invisible to my eyes but had just barely resolved on the highest ISO images. 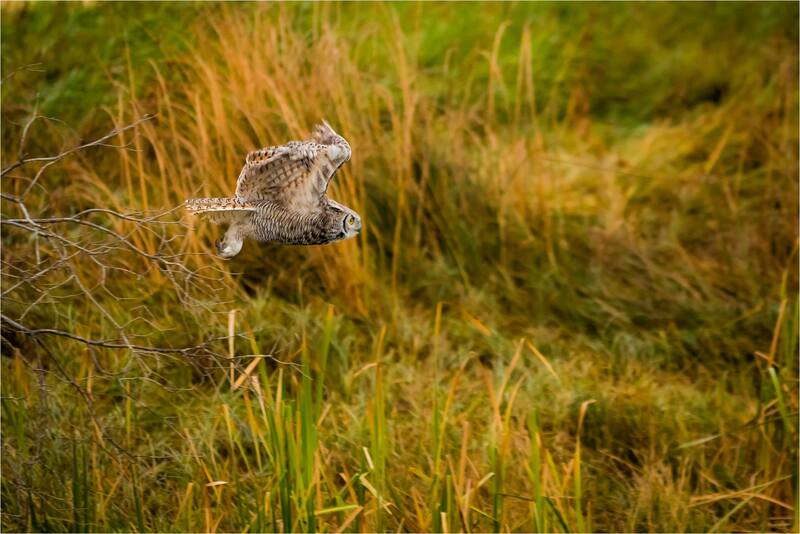 I returned two days later before dawn and saw the pair of owls working out of the same eastern window. I set up on the same western window and could see them through main entrance as the sun rose. 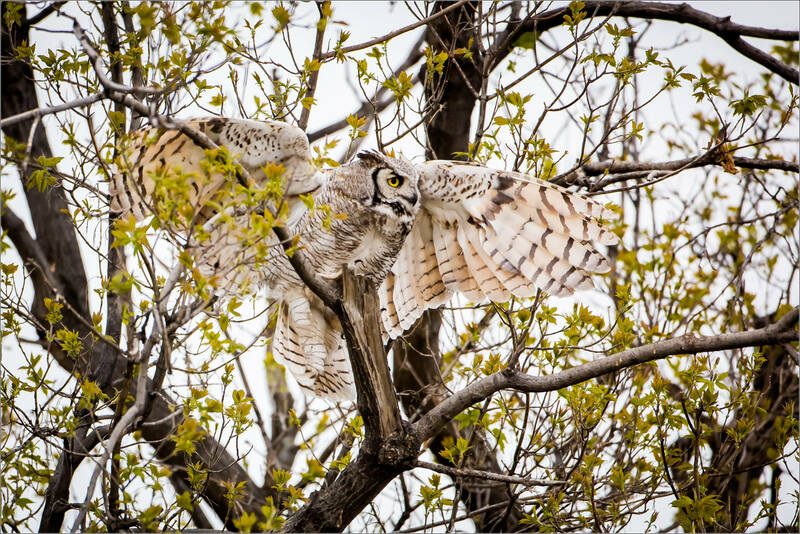 Their activity wound down as the day wrestled with the night and soon they were perched on the same beams as before. 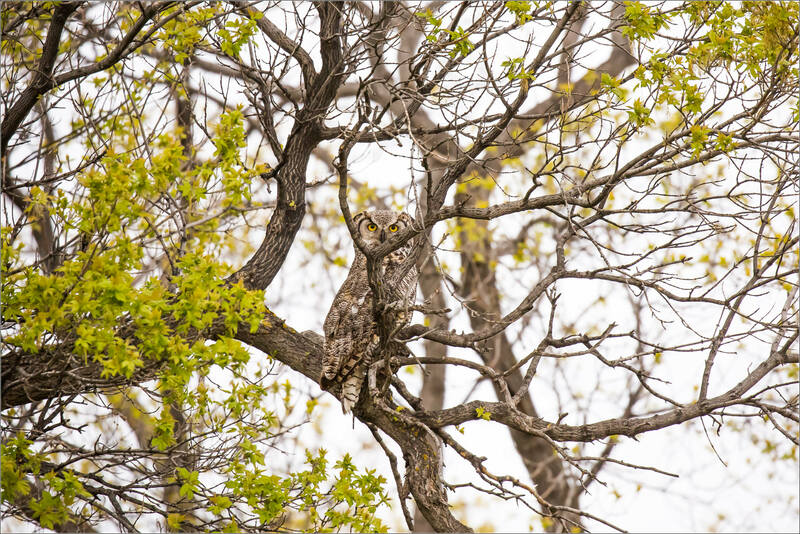 This time, I took a wide path around the side of the barn and was able to photograph each owl on their respective beams through the eastern window (per the image at the top of this post and directly below). 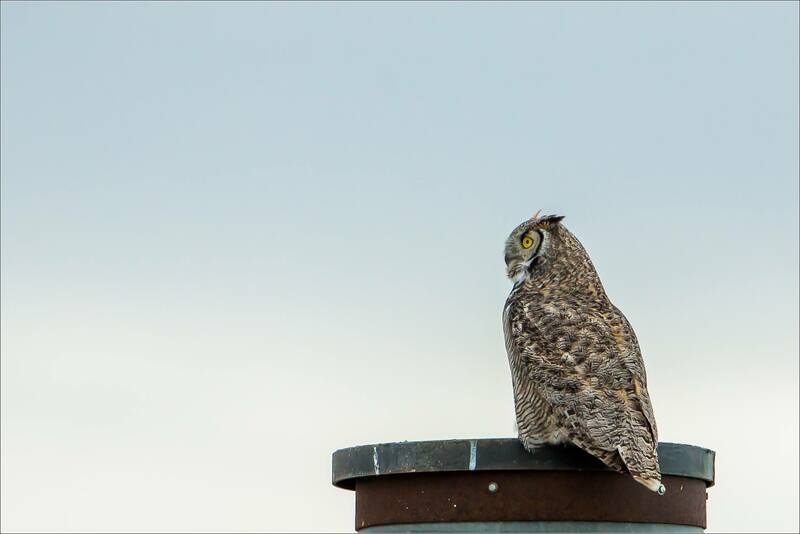 I returned to my original spot and as I came around the barn saw that one of the owls had flown up to the top of a silo. 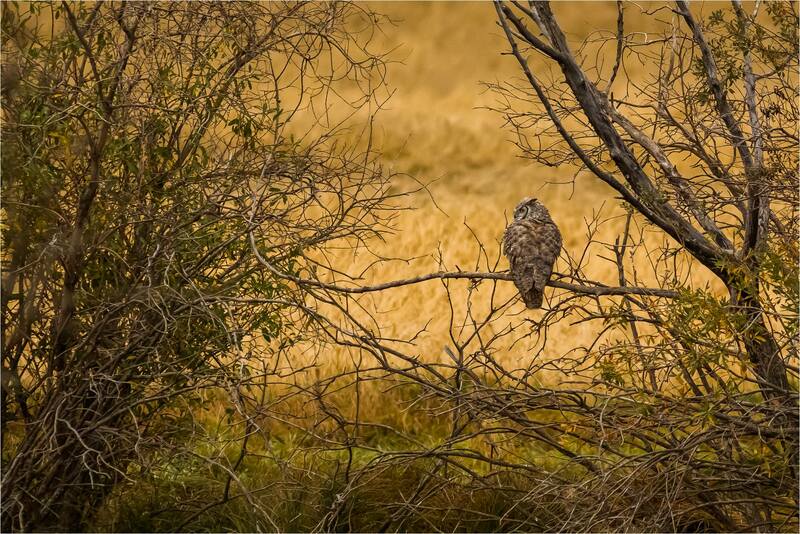 It was perched there scanning the fields. I guess it wanted one last snack before its nap. 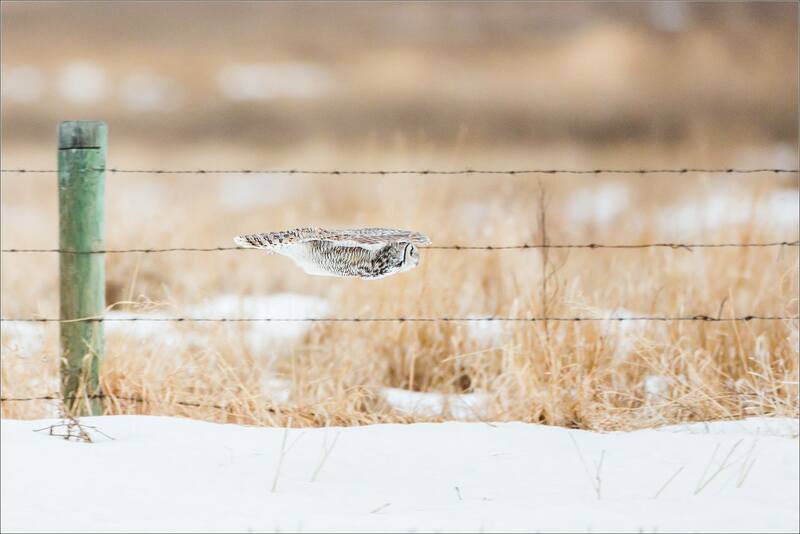 It stayed up there for ten minutes and then flew along the fence-line, dropped on a fence post for a minute and then glided over the patchwork of snow and grass to a mound of earth a few hundred meters away. 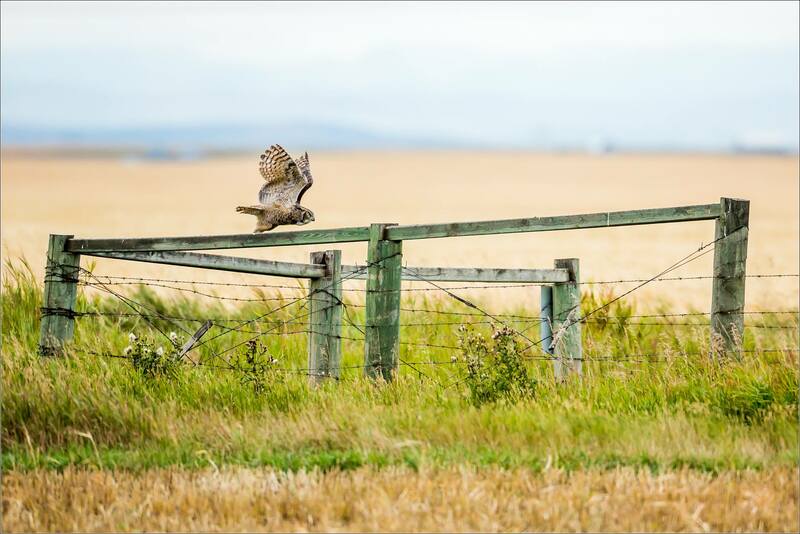 I waited a while longer to see if the owl would come back or its mate would head out. 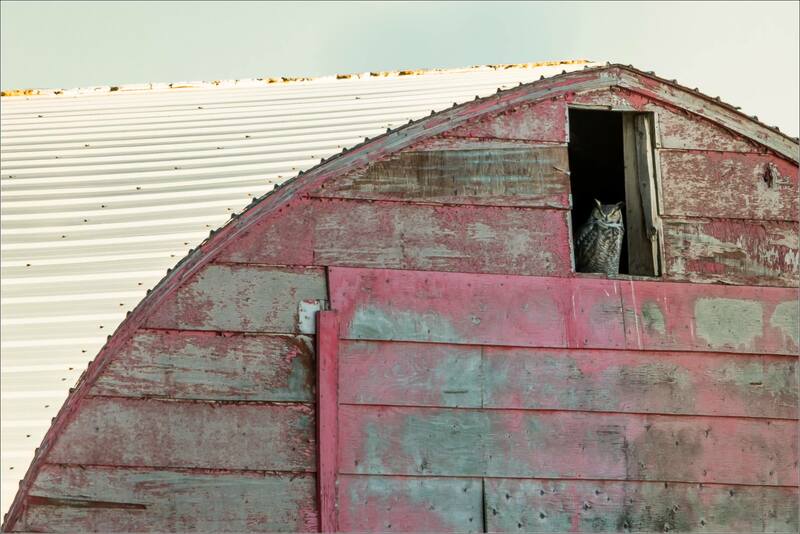 Neither happened and I packed up as the owl inside the barn dropped off to sleep. I’ll head back to see about that window again in a couple of weeks. Maybe they’ll give me an opportunity then. It was great to see these beautiful birds either way. They have amazing faces and I really enjoyed studying them for a couple of hours.